When you need super compact rear and front lighting, with USB convenience, and an exceptional build quality, look no further than the Exposure Trace & TraceR Mk2 Light Combo. 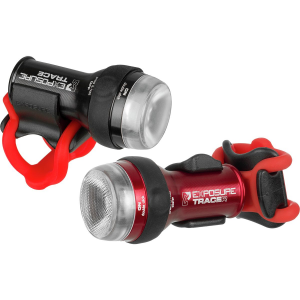 Providing you with side illumination and battery life indication, this light combo assures you stay visible, both day and night, in the urban jungle and beyond. The Trace head light shines 110 lumens of light on the road ahead of you, while the TraceR emits 75 lumens of red light to let motorists know you're on the road too.